Hi all, I hope you’re all very well and excited about thanksgiving, I know I am. If you’re a regular reader of my home and garden blog then you will know that my favourite room in my house is my kitchen. I recently bought a Kenwood K-Mix and have been baking so much that my whole house smells like pumpkin cookies. 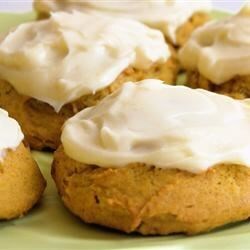 I wanted to share my Pumpkin Cookies with Cream Cheese frosting recipe with you all, as i thinks its absolutely perfect for the fall weather and makes a great thanksgiving present or offering to a host. This recipe should take 40 minutes altogether, 30 mins for preparation, 10 mins for cooking. Whisk together the flour, baking powder, ginger, cinnamon and nutmeg in a bowl. In your Kenwood K-Mix bowl, add 1 cup of the butter, the white sugar, brown sugar, egg and vanilla extract, and beat on high for 30 seconds, or until the mixture is smooth. Add the pumpkin puree to the wet mix, and mix for 15 seconds or until smooth. Gradually add the dry mix into the wet mix, stir by hand so as not to over mix. Batter should be moist at this point. Spoon batter onto the prepared baking sheets using a teaspoon. Make sure each cookie is 2 inches apart. Bake in the preheated oven for 10 - 12 minutes, or until the cookies are lightly browned. Let the cookies dry for 5 minutes before removing them to finish the cooling on either a wire rack or a piece of waxed paper. Beat cream cheese, ¼ butter and 1 teaspoon of vanilla extract in a bowl. Add the icing sugar gradually until frosting is smooth. When cookies are cool enough top with the cream cheese frosting. ENJOY! The perfect present for any host.